We had perfect conditions for this year’s event. Light winds and warm days made for some hot scores. 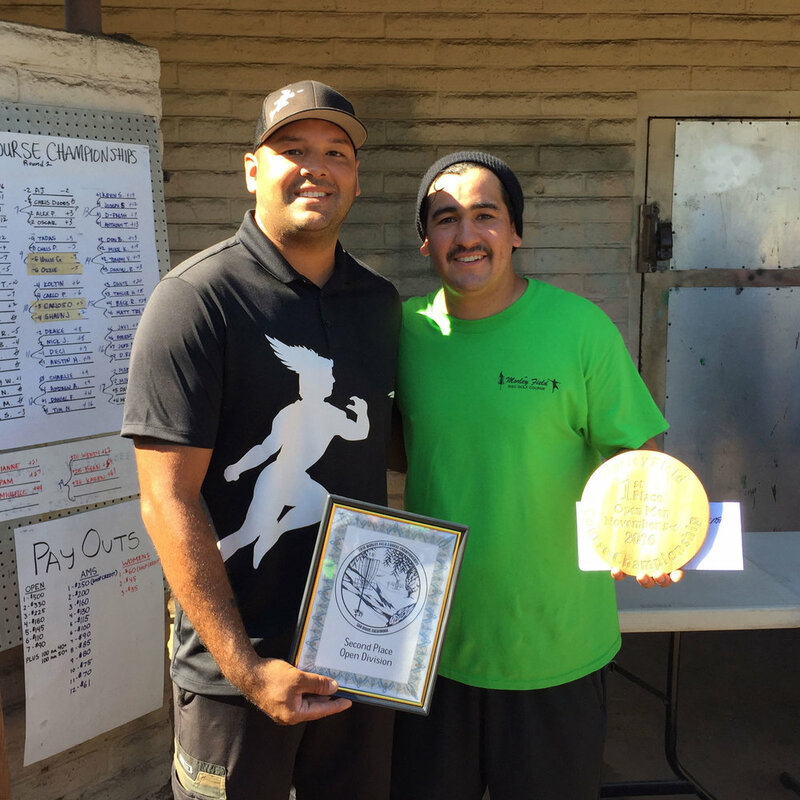 Eventual Open winner Carlos Caballero shot a personal best -14 in the first round. He followed that with a solid -2 on the long and treacherous 2nd round course and finished with a -12 on the third round short layout. Going into the finals he had a five stroke lead and all but ended the drama on the first hole by being the only member of the final four to birdie. Not content to sit on his laurels he continued to birdie the first 5 holes in a row finishing with a -7 in the final nine and a very respectable -35 for the tourney. He received $500 and a custom George Spracklen trophy for his wire to wire leading performance. 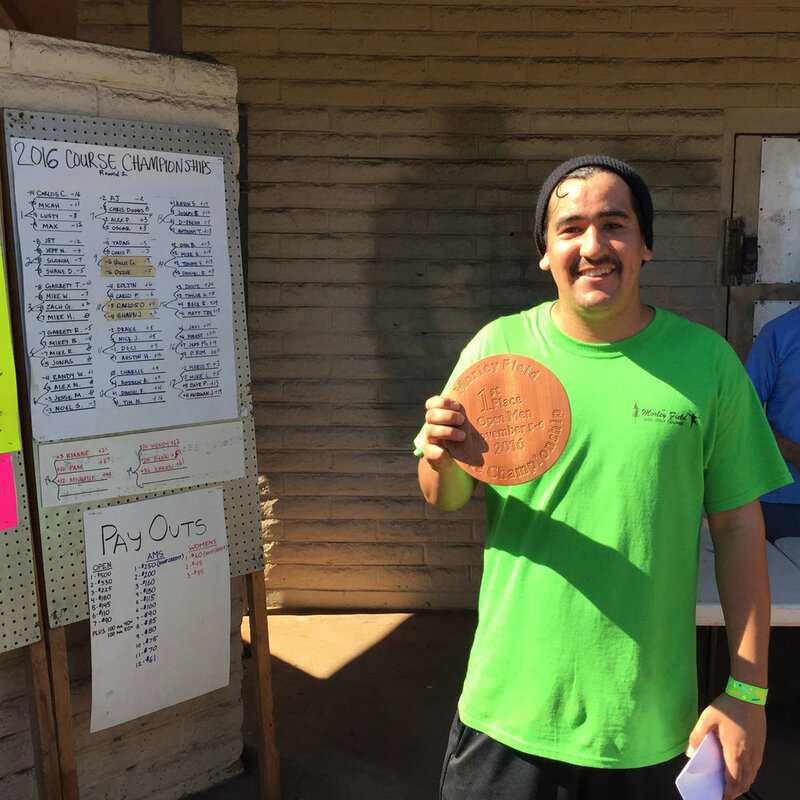 Micah Dorius, many time course champion took fourth overall but was the highest finishing master player and won the $100 bonus. Mike Slonim finishing one stroke behind Micah won the grandmaster bonus of $100. Jet and Max Nichols had a great battle for second place culminating on the very last hole when Max bogeyed and Jet deuced to gain second place. 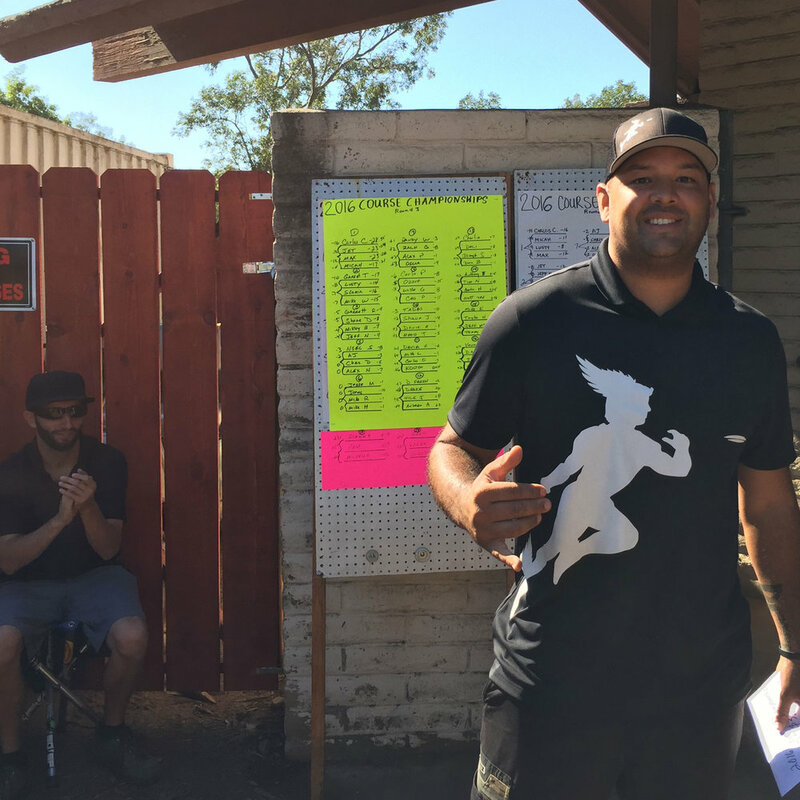 This year’s Course Championships payouts were the highest in history thanks to an additional $500 sponsorship for this tourney by San Diego Hydro. The amateur division had a lot of drama and a different leader after each round. Tadas Mikuzis had a hot -9 in the first round to lead. Carlo Portacio had the smoking -2 on the long course to take over the lead after the second round. But Ozzie Fausto shot a -10 in the third round to secure the win this year. 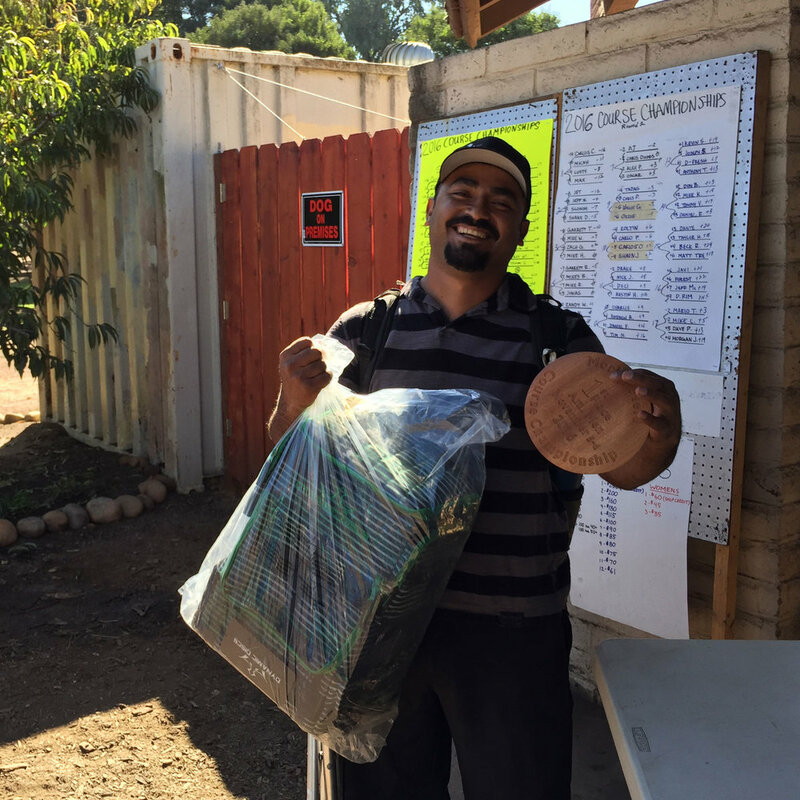 He won $250 worth of prizes including a Dynamic Distribution Ranger Bag filled with discs and a custom wooden trophy. 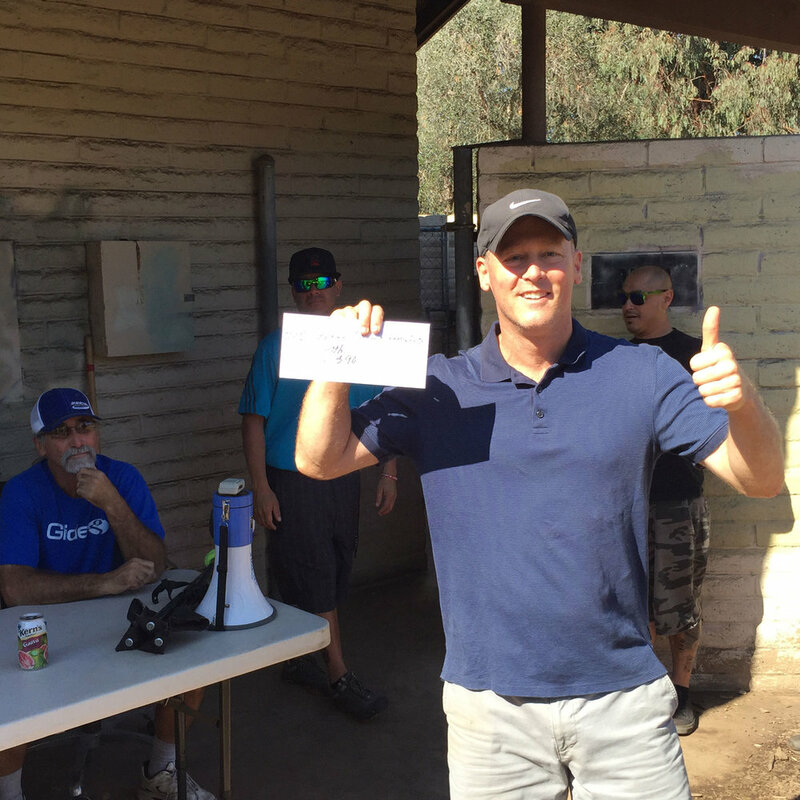 Ozzie also earned the right to play in the grinder on Saturday November 12 at 9:00 for the last Open spot on the San Diego Team. The women’s division saw another wire to wire winner with Rianne Hamilton finishing with a women’s tournament best -2 in the third round for an 8 stroke victory over second place finisher Pam Vaughn. Michelle Chambless took third. All the women were amateurs and as such received prizes for their winning efforts. 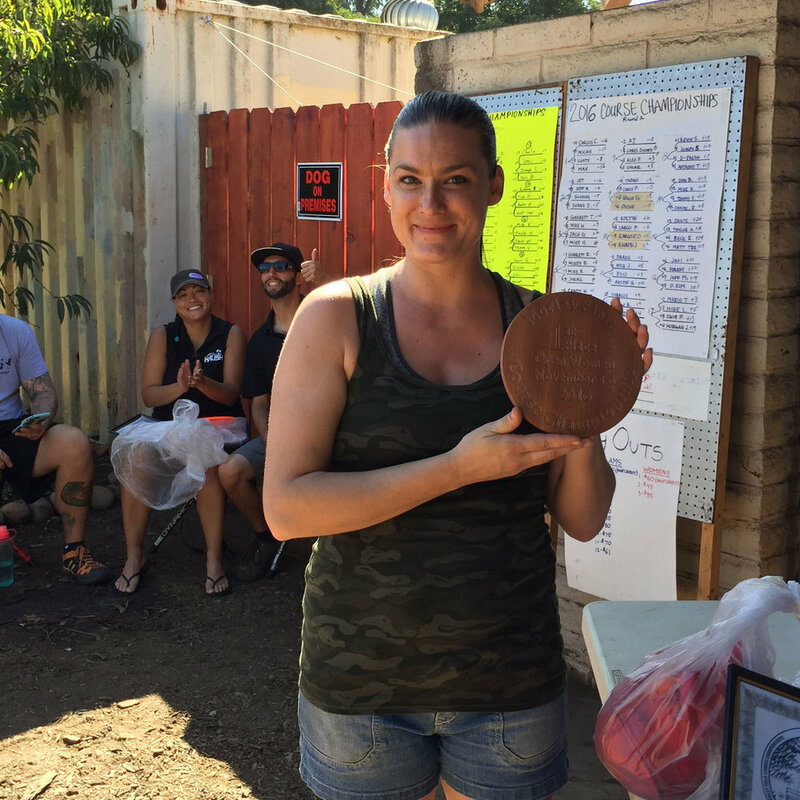 Rianne also received a custom wooden trophy for her first ever Women’s victory. This event is always played out on a closed course which allows for us to put up the incredibly difficult second round course that includes the three long pads and several extended pin positions not scene in any other tourney throughout the year. In addition this year’s 67 players all received a commemorative T-shirt and Pizza and salad lunch as part of the tourney experience.